I'm still working on my outfit photographing technique and haven't quite got to my desired level (being pinned by a stranger on Pinterest) but here is one I managed to snap last week early in the morning during the brief few minutes before finishing getting ready for work and waking the toddler up to prepare her for day care. It's really hard to find somewhere to balance your iPhone such that you can get a full body shot in decent light with a non-heinous background. This was taken by leaning the phone against the stubby aerial of my Suzuki Swift, activating my camera timer app then trotting up the driveway a bit, striking a pose and hoping not to be busted by any work-bound neighbours . . . unfortunately because our house faces east, the morning sun is behind me and it was a bit overcast so it's got kind of a dreamy filtered look to it. I combated the lack of visible detail by taking a few different angles. The most expensive thing pictured is my pedicure which was an astonishingly overpriced $35. This look is a bit of a departure for me - being short and having a bit of a fuller figure at the moment, I've been a bit wary of any non-fitted pants, especially lightweight patterned ones. I'm happy to say that after road-testing the outfit for the [fairly warm] day, I felt cool in all senses of the word! I am absolutely in love with KMart's basic $5 tees. It seems like it's always hardest to find the simplest things and I had been after a good fitting basic black tee for ages. Even Bonds didn't deliver as expected. So when a friend alerted me to these soft, comfortable, well-fitting bad boys, I shot over to KMart and snapped some up. I got four for the same price as one clingy Bonds number. Nice neck detail and even a dipped hem for extra luxe! All this for $5. It will be interesting to see how they stand up to a few washes which will reveal just how fashionomical they are. Great work - ha ha O love that the pedicure was the most expensive! It wasn't even a good pedicure either, which made it even more outrageous. That place has been struck off the list! I'm impressed!! 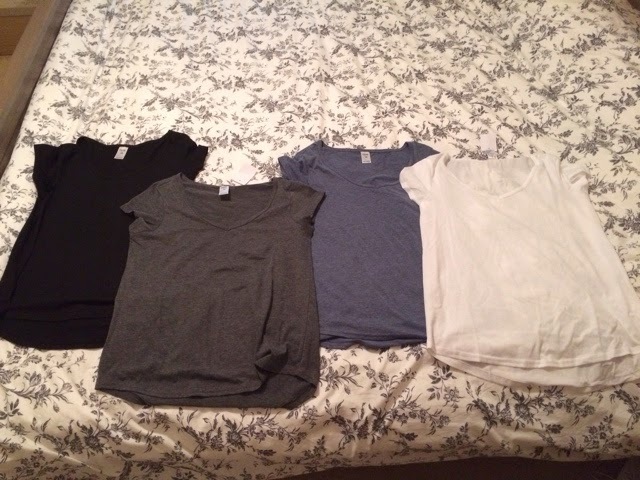 I've been looking for basics tshirts because basically I have none. Guess where I'm heading tomorrow?! Thanks so much for joining our Outfit Under $50 challenge. Yay! I'm seriously considering stockpiling my size!